The rainbow theme continues! It may have something to do with the fact that during the past week and a half, the weather here has been quite autumn-like. Stormy wind, hail, snow, rain, and gusts of wind every day. 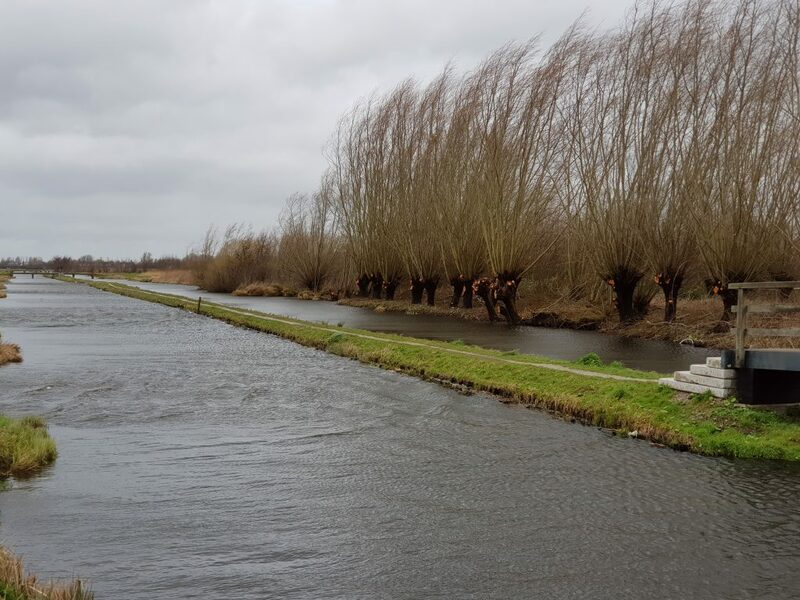 It’s not that bad for nature, because The Netherlands still has not recovered from the extremely dry summer we had last year, but for the humans, it’s a bit depressing. 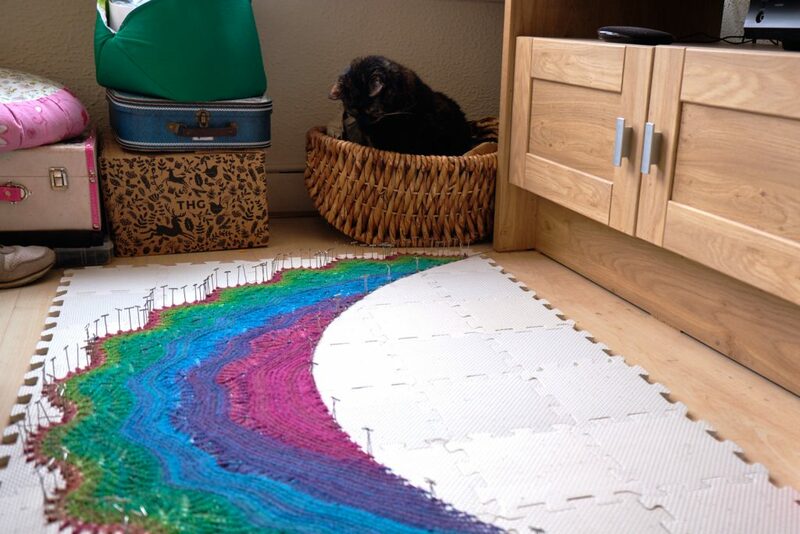 So, after spinning a rainbow yarn, I opted to knit a rainbow shawl next. 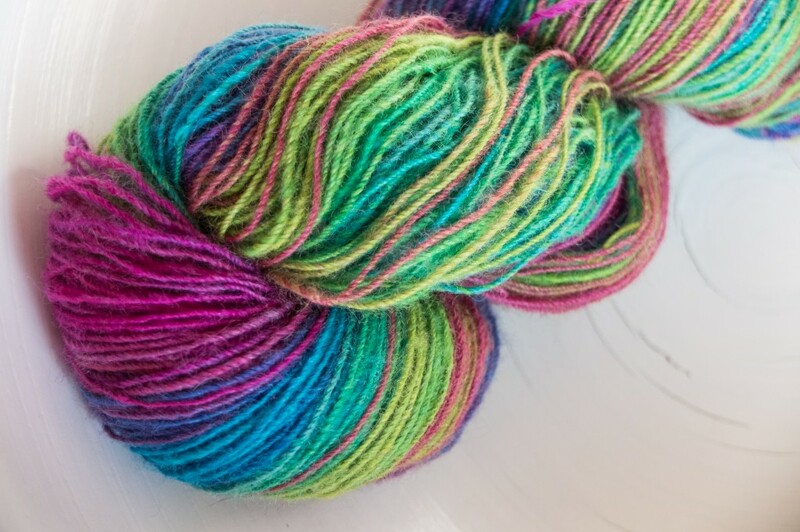 I did not use the yarn I just made, but instead, I opted for a beautiful rainbow yarn that had been languishing in my stash for almost five years. I spun it during the Spring Fling challenge in the Jenkins group on Ravelry. 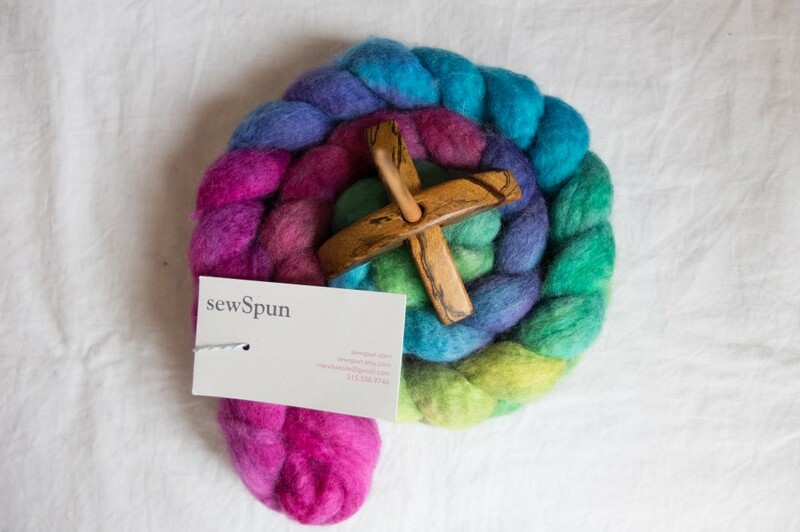 Back then, I spun only on Turkish spindles, and this was one of my first spindle-spun yarns ever. It took me so much longer to spin 100 grams back then than it does now. It took me over a month, but that included a special extra challenge: ply-on-the-fly. That was the one and only time that I did that, and it was a fun technique to learn. These happy colours seemed perfect for knitting a dainty shawlette. The colours formed a slow gradient, so that would look good with a wider fabric. I decided to knit Part of Your World by Lily Go. This bottom-up, asymmetrical shawl looked as if it would work well with this yarn. I also had just enough yardage for the smallest size. By the way, I briefly considered vlogging about this project instead of writing a blog post. 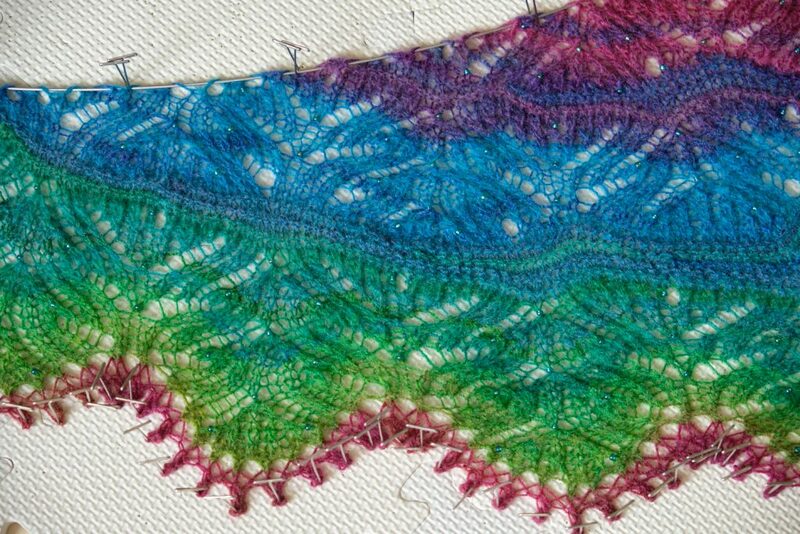 I even recorded myself doing a show-and-tell about this shawl. But in the end, I didn’t finish the vlog, because I have no experience with video editing whatsoever, and it was taking me a long time to learn the basics of the video editing program. I got fed up with it and decided to just do an old-fashioned blog post instead. I’m curious, though. Would you like to see me make a vlog someday, or do you prefer reading? I myself have a preference for reading usually (because I can do it at my own speed), but I do like watching people talk if they are inspiring. What do you think? 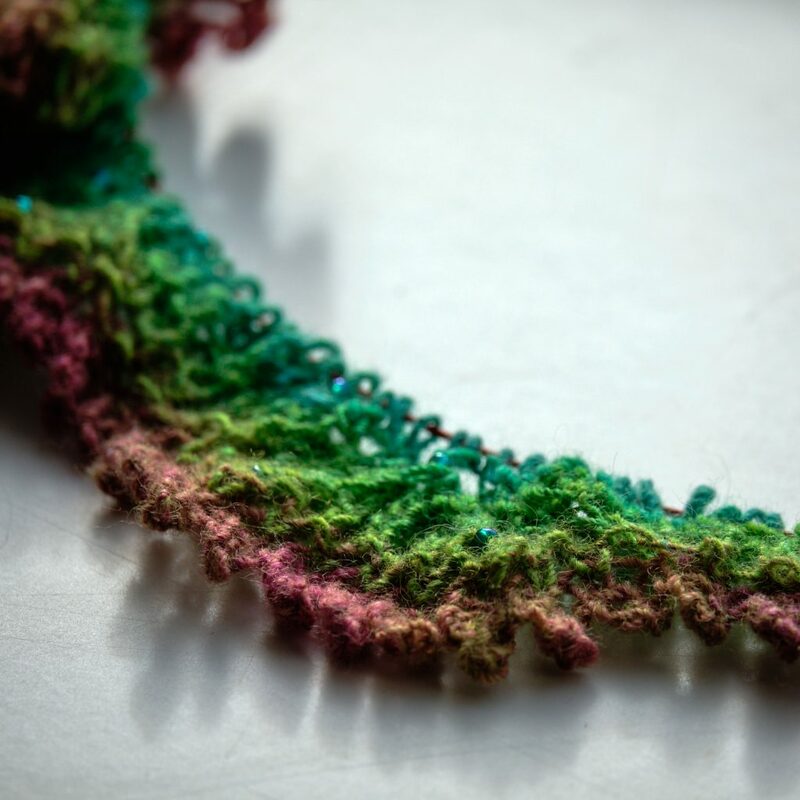 After the cast on, you knit a beautiful lace edging. While I was knitting I vaguely wondered why some stitches were marked with a yellow background colour. I decided that that probably was not important or meaningful and knitted on. Until I finished the edging and my brain turned back on. Beads. Of course. There were supposed to be beads. So I ripped back. I was able to salvage the picot cast on. Phew. Then I knitted the edging again, this time with beads. I used some 8/0 beads in a blueish green, which reminded me of iridescent beetle wings. That colour went together well with all the colours in my yarn. Version 2.0 with beads looked better, so at least I didn’t restart for nothing. And the edging was pretty. Then the asymmetrical body started. You basically knit wedges of garter stitch (from one side) or lace (from the other side), using short rows. I did them as described in the pattern and knitted the first garter stitch wedge. After finishing the wedge, I decided that I didn’t like the way the short rows looked, and I ripped back the wedge and redid it with German short rows. Did you notice that I only tend to think when I’m not in the middle of a section? Actually, that’s not entirely true. 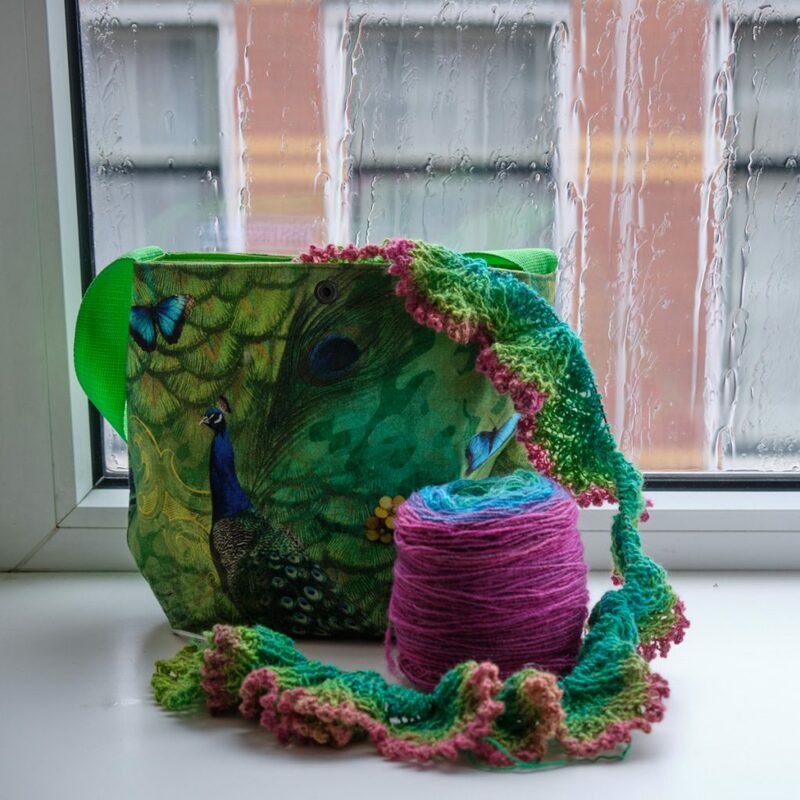 As I knit, a background process in my brain is registering the bigger picture and pondering whether it’s right, and then, after a while, the answer pops up, usually when I stop focusing. Brains are funny. Anyway, the reworked garter stitch looked better, and so I continued with the first lace wedge. I knitted it as written, and then, when the section was done, I started thinking (of course) and worrying whether the pattern repeats would line up properly (you are decreasing all the time, so how does that work if the lace pattern doesn’t change?) and oh no, I should have added beads here too! 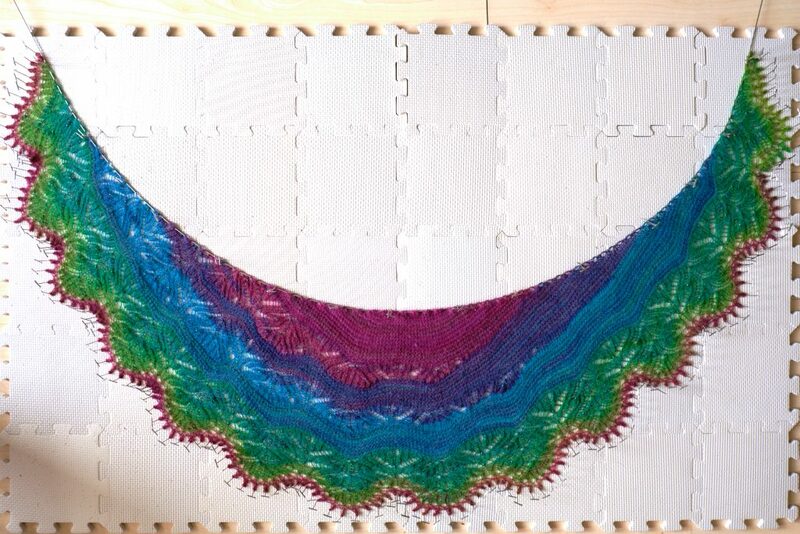 The pattern didn’t call for beads in the lace wedges, but I looked at my shawl and really missed them… so… rip rip rip! Adding the beads (in the same pattern as in the edging) did improve things, and I decided not to worry about the pattern repeats lining up anymore, and trust Lily Go. So things were going much better again. I even made it to the end of the next garter stitch wedge without any problems! But then I knitted the next lace wedge and I didn’t like the way the gradient unfolded. There was a bit of pink and light purple there that was just appearing too early, making the transition harsh, and obscuring the pattern. Rip rip rip. Cut out the offending bit of yarn and re-attach it the other way around. Re-knit. Phew, much better. 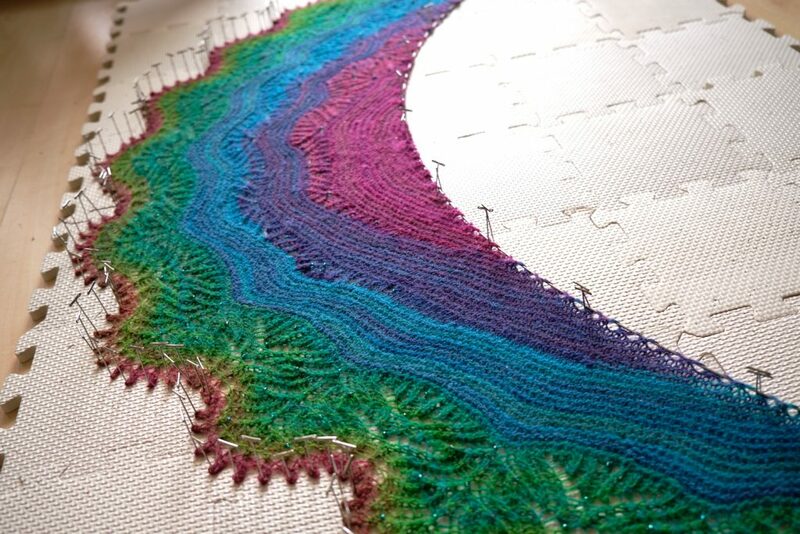 And suddenly, all I had to do was keep decreasing until I ended the shawl in the middle of the neck. It was surprisingly painless. Even binding off was a breeze. And after finishing and firing up my brain, things still looked ok. Time to block! As I blocked the shawl, I realised how lucky I was with where the colour transitions of the gradient were, compared to the pattern sections. They play together well. Here it is in all its glory! Part of Your World. That line is the title of Ariel’s song in The Little Mermaid by Disney. It was one of my favourite Disney movies when I was little. 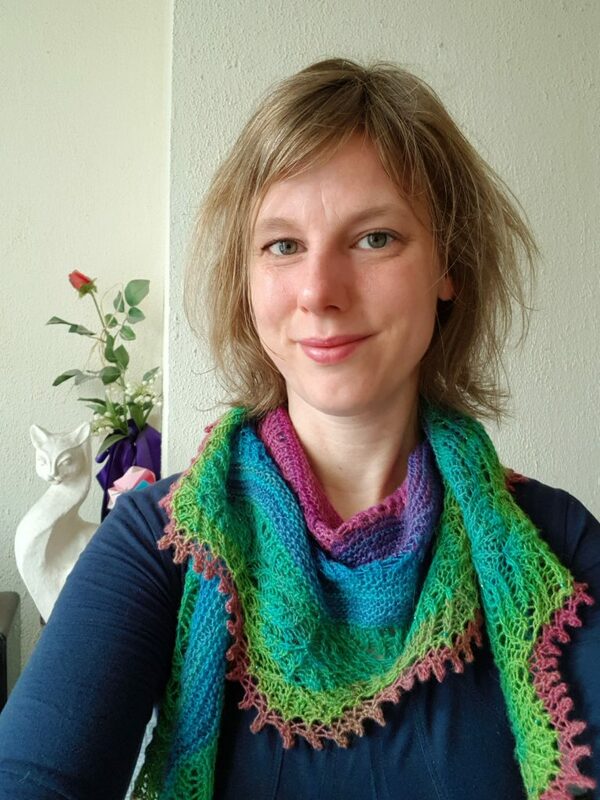 I sang along with every song (in Dutch), and knitting a shawl that is inspired by that song makes it even more special. Plus, somehow I associate rainbows with mermaids. I don’t know why. As you can see in the picture, the rainbow is upside-down. I decided to start with red at the edging, which is furthest away from my face, and end with pink, which is more flattering for my skin tone. But if you turn this photo upside down, you really cannot see any difference with a real rainbow in the sky, it’s a perfect recreation. Believe me. This is the side with all the lace. You can see how subtle the beading is. The pattern calls for 6/0 size beads, but I used the smaller 8/0 size, because I don’t want them to be too prominent. Just some subtle dew drops here and there. The other end of the shawl contains more garter stitch, which becomes nice and wavy because of the shape of the lace edging. Very water-like, and perfect for a fashionable mermaid. You know what you can find at the end of a rainbow, right? I can confirm that Freya is pure gold. 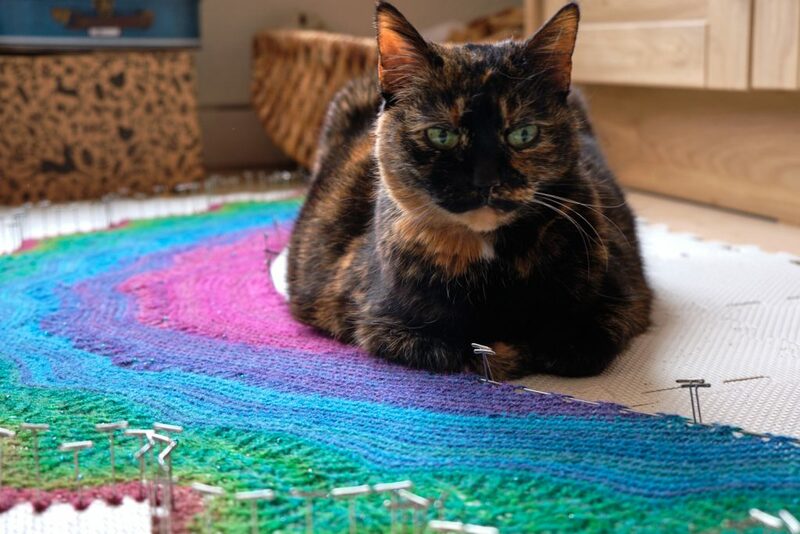 Dutifully guarding the wet shawl, Freya wonders whether it will look good with her eye colour. I don’t think she needs to worry. And then it was dry and I could try it on! It’s quite colourful, but not too much. The beads are only visible up close, so only my friends will notice them. I’m very happy with how this shawl turned out. I actually briefly considered casting on another one of these, with some white cobweb weight yarn and smaller needles, in size L. I even started casting on. But I just couldn’t do it. The picot cast on is very beautiful, but it is such a lot of work keeping track of how many stitches you have made. For each picot, you cast on a couple of stitches and immediately bind them off again, resulting in only two new stitches per picot. I’m still recovering from the first time, so I frogged it and maybe I’ll do it again in a few years or so. Thank you, Kelly! Freya agrees that she is gold, of course. This was a fascinating read, with rewards along the way: meeting Freya and then seeing you in the finished project. I identified completely with every stop, think, realize, and rip!